At Industrial Bearings & Services, we strive to get your business the top of the line products you need, when you need them. When it comes to belts and sheaves, we’ve got it all. Whether you need the parts separately, together, or customized, we are here for you. Let us use our 200 years of collective experience to help you with your belt and sheaves needs. No matter your industry, in the Houston and Southeast Texas area at large, whether it is energy or agriculture, we will do our best to find the best product that suits your business needs. 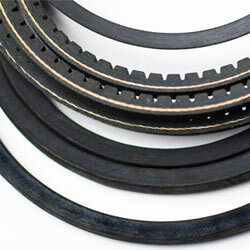 We offer most sizes and types of belts and sheaves. For your more specialized projects, we also provide a customized service where we can work with the engineers from the design phase to make sure your end product meets your specifications. Please contact us for any additional questions regarding products and customization. Here at IBS, we carry a variety of brands including Bando USA, Jason Industrial, Carlisle Transportation, Tb Wood’s, and Maurey Manufacturing. Bando USA specializes in producing power transmissions belts for both the automotive and industrial fields. In their product lines, they feature 26 different types of industrial belts. Maurey Manufacturing Corporation creates a variety of top of the line sheaves. Their sheaves include light duty sheaves, split steel sheaves, air movement sheaves, integral hp sheaves and more. Jason Industrial Inc. has a focus in industrial rubber products, which include power transmission belts and urethane power transmission belts. In their product line, they include a variety of belt drives, pulleys, sheaves, v-belts, synchronous belts, etc. Carlisle Transportation products has a large line of industrial belts, as well as other related components. A few of the belts they feature include heavy duty industrial v-belts, synchronous belts, banded belts, v-ribber belts and specialty belts. TB Wood’s Incorporate is the “large sheave” expert when it comes to v-belt drives. From premium drives, to narrow drives, to classical and light duty drives, they’ve got it all. Finding the right belt and sheave for you is as easy as asking any one of our trained team members. Feel free to visit us at our Houston office, or call us at 713-329-9800. You can also request a quote.